Zharnel Hughes. Remember the name. In the next few years, this Caribbean sprinting sensation who trains with Usain Bolt could be one of the stars for Britain at an Olympic Games. 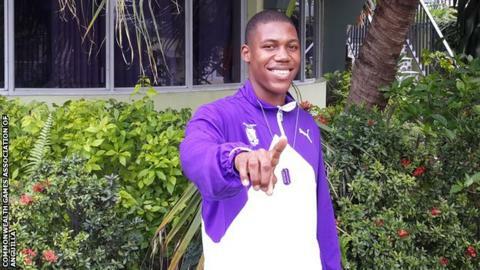 The 18-year-old Anguillan made headlines last weekend when he won the 100m at the Jamaican Inter-Secondary Schools Boys and Girls Athletics Championships. His time of 10.12 seconds beat a record set by a certain Yohan Blake, who also shares a training ground with Hughes. Blake's record was 10.21 seconds. Anguillans can compete at the Commonwealth Games and World Championships but, as a British Overseas Territory, athletes from the island are unable to enter the Olympics as Anguilla is not recognised by the International Olympic Committee. If Hughes wants to perform on the biggest stage of all, he may choose to follow in the footsteps of Shara Proctor - the British record long jumper - who decided to transfer her allegiance from Anguilla to Team GB in 2010. The prospect of representing Britain is certainly on Hughes's mind as he prepares to compete at the 200m at the Commonwealth Games in Glasgow. "It is something I always think about," said Hughes. "I think that (competing for Great Britain) would be the best choice. "It is something I need to think about before I jump to conclusions and something I have to talk to my coaches about. "It would be a great experience to represent Great Britain at an Olympics, at the same time representing Anguilla." Hughes is training in Jamaica for this summer's Games and his preparation was put into focus this week as the Queen's Baton Relay, the main warm-up for Glasgow, passed through Anguilla. On Saturday, 30 March, Hughes won the 16-19 age group of the Boys Championships. This follows victory at last year's Junior CARIFTA Games in the Caribbean, again in the 100m. Hughes was raised in Anguilla by his mother, who is a housekeeper, and his father, who works as a taxi driver. When he was 10, he took part in a sports event to mark Commonwealth Day. He was subsequently chosen to represent his school and won five medals in his first competition. In the eight years since, Hughes has continued to enjoy success. At the age of 16, he won a scholarship to study at the elite High Performance Training Centre in Kingston. Life at the centre is simple. He listens to soca and reggae music and plays racing games and flight simulators on his computer, with hopes of becoming a pilot one day. He also loves training next to Bolt and Blake, and his coach Glen Mills, and says the Olympic champions share some words of wisdom. "They give me a pep talk at training," he said. "Being alongside them, seeing them fighting through the programme when it is very tough - they don't give up. "Both of them encourage me." Hughes then pauses and clears his throat before giving his best Bolt impression: "'Big man, you are doing great, man, you are doing great work.'" He added: "Blake teases me. At the same time, he is motivating me. He says 'just stay focused, don't get panicked by anybody, just go out and do your thing'." Between now and Glasgow 2014, Hughes has a busy schedule including the IAAF World Junior Championships, which will be held in America only a few days before the start of the Games. The teenager is treated like a hero in Anguilla following his successes so far. He said: "They are wonderful back home. I get a lot of messages from young ones that say, 'Zharnel, I am looking up to you, you are inspiring me, and because of you I am doing track and field'. "Those are the things that are encouraging me to do so well. It makes me feel wonderful inside because I know I am doing something great. I follow my motto that I saw online - 'Inspire Before I Expire'. I know God has a plan for me." Whether that plan includes competing for the UK at an Olympics remains unknown at this stage. For now, British fans can look forward to seeing this talented youngster in Glasgow.